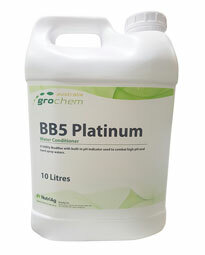 BB5 platinum improves spray performance in a safer and more eco-friendly manner than competitive surfactants. BB5 platinum adjusts pH in water to the ideal pH range of 4.5 – 5.5 without the requirement of lab tests, litmus paper, or guesswork. The new patented phosphate-free formulation is a major benefit to growers in areas with eutrophication concerns. BB5 platinum turns the solution yellow when the optimal pH has been achieved. It’s unique acidifying and buffering components reduce pH to ideal levels (pH 5) while preventing over-acidification. BB5 platinum will acidify all alkaline waters as well as neutralise the dissolved salts present in hard waters.